Are you wondering why they say raw almonds are better for you than roasted? The answer ‘because the roasted almonds are tastier’ may be a suitable answer. According to the study (Food Chemistry, Volume 151, 15 May 2014, Pages 31-39) the levels of most alcohols increase significantly (500 times) in response to roasting. The nutritional value of dry-roasted almond with no added oils or spices is very similar to that of the raw nut. Roasted almonds are easier to digest. On the other hand, raw almonds will contain more of Vitamin E, which results in higher antioxidant potential. Also required: a 22 cm removable cake tin (spring form), 4 bowls and an electric mixer. 1. Preheat oven to 180c degrees. Make a single layer a piece of baking paper for the base of the 22 cm springform tin, and a double layer wide to cover the sides. 2. Place white chocolate in a bowl over a saucepan of slowly steaming water. Make sure that the bottom of the bowl does not touch the hot water. 3. Using an electric mixer beat egg yolks, Chambord and caster sugar until pale and creamy. When the chocolate is melted, add it to the mixture and continue mixing on the lowest speed until completely incorporated. 4. In a separate bowl, whip the cream until soft peaks form and fold the whipped cream into the chocolate mix along with almond meal by using a large silicon spatula. 5. In a clean and dry bowl, whisk the egg whites until soft peaks form. Then gently fold the egg whites into prepared almond mixture through in a figure of eight movement with a large spoon. 7. Pour 1/3 of the cake dough into the middle of prepared tin and spread. Make a layer of raspberries and pour the rest of the cake mixture. 8. Bake for 25 mins at 180 degrees in a fan forced oven. Then turn off the fan and bake for another 30 minutes at 165c. Once the oven is turned off wait for 5 minutes then take the cake out from oven gently and cool the cake in the tin. 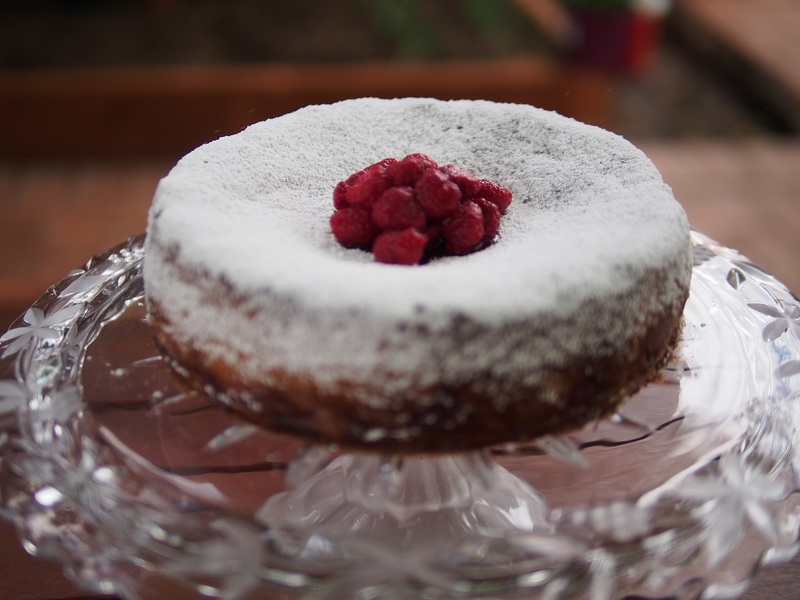 The cake can be decorated with icing sugar and fresh raspberries. Total: 3000 calories. Per serve: 300 calories. ← Almond Pear Torte Recipe.